You may represent yourself in a Texas divorce. This article discusses a packet of documents assembled by the organization Texas Law Help. These eleven forms are for the use of people in a divorce with children who are able to resolve all financial and childcare process and do not need a judge to rule on any such issues. Texas Uncontested Divorce Process With Children Packet Step 1: The first document in this packet is an eight-page petition for divorce. This document must be served upon your spouse in order for the legal process to proceed. Texas Uncontested Divorce Process With Children Packet Step 2: The second document is an out-of-state party affidavit only to be completed if the spouse you are filing against does not live in Texas. Texas Uncontested Divorce Process With Children Packet Step 3: The next two forms are for the person who is responding to the complaint. The waiver of service will be filed if a spouse waives their right to be notified of future hearings. The answer form can be filled out to formally dispute or agree to negotiate with your spouse. Texas Uncontested Divorce Process With Children Packet Step 4: The next document is a final decree of divorce that will be signed by a judge. You will be directed to complete this document under court supervision. 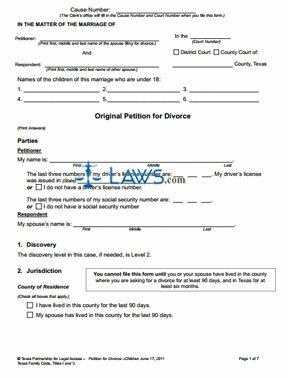 Texas Uncontested Divorce Process With Children Packet Step 5: The last six forms are various exhibit forms that should be attached to your petition. The first is an eight-page form documenting your child custody arrangements. Texas Uncontested Divorce Process With Children Packet Step 6: The next document concerns visitation rights for the parent without custody. Texas Uncontested Divorce Process With Children Packet Step 7: The next two documents concern child support and medical support, respectively. Texas Uncontested Divorce Process With Children Packet Step 8: The next document is a form summarizing information about family members. Texas Uncontested Divorce Process With Children Packet Step 9: The last document is a form instructing your spouse's employer to withhold a certain amount of their wages for child support.